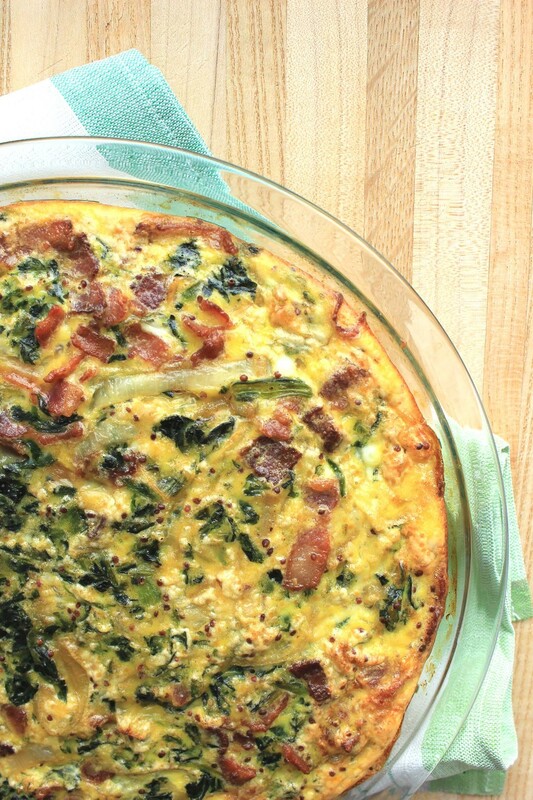 I’m always on the look out for delicious ways to eat more leafy greens and this frittata channels the Classic Spinach Salad while transforming it into a meal. Crispy, salty bacon; rich caramelized onions, and a little tang from a generous dose of whole grain mustard and a dash of red wine vinegar. Frittatas are one of my all time favorite dishes to cook – as evidence may I present: Exhibit A, Exhibit B and Exhibit C. They’re simple, healthful, and easy; they don’t require extra fussing with a crust (sorry quiche), make great leftovers, and can serve one or two just as easily as a crowd. This particular edition also has one additional selling point: I’m betting that 99% of the ingredients are already in your fridge, freezer, or pantry right now. Which means you could be eating Spinach Salad Frittata for dinner tonight or breakfast tomorrow without making a trip to the grocery store! Dice the bacon into 1/4 inch strips and cook in a large sauté pan over medium heat until crisp stirring occasionally, about 5 minutes. While the bacon is cooking, slice the onions into 1/8 inch rounds or half moons. Remove the bacon with a slotted spoon and drain on a paper towel-lined plate. Pour off the bacon drippings, reserving approximately 2 teaspoons in the pan. Reduce the heat to low. Add the sliced onions to the pan and sauté with 1/2 teaspoon kosher salt and 1/4 teaspoon black pepper for 10-12 minutes until caramelized and softened. Meanwhile, drain the defrosted spinach pressing out as much of the water as possible. In a medium bowl, whisk together the eggs, milk, whole grain mustard and 1/4 teaspoon kosher salt. When the onions are caramelized add the drained spinach and red wine vinegar to the pan. Fluff the spinach with a fork to combine with the onions. Prepare a 9 inch pie plate or baking dish with a light coating of non-stick spray. Evenly spread the spinach mixture in the bottom and sprinkle the crisped bacon pieces over the top. Pour the beaten eggs into the dish and bake at 350 degrees F for 30-35 minutes or until the eggs are set. Yes! I used a large sauté pan, 9 inch pie plate, medium cutting board, and a medium mixing bowl. I also used a dinner plate, chef’s knife, slotted spoon, wire whisk, and rubber spatula in addition to measuring cups and spoons. That’s it! I made Spinach Salad Frittata when Mike and I were hosting a guest for a late morning breakfast and we all agreed that the flavor combination worked. The spinach is the star with supporting, but essential appearances from the caramelized onions and bacon (how bad could that be?) The mustard adds a little spice and turns a brunch dish with really simple ingredients into a recipe that could easily transition to dinner.